The following post is a more detailed version of the article that appeared in the July Edition of the Leading Notes Online Magazine (leadingnotes.org). That article may be found directly on the Leading Notes Wesbsite by using this link. One of the fascinating things about social media is its ability to minimize the size of the world by bringing far-spread communities together in accessible ways. In 2005, I took notice that there was not a lot of quality information concerning the music education profession being generated and injected into the Internet. Although there were a “hodge-podge” of music-related start-up forums and static websites that offered a limited amount of resources, there was a noticeable absence of music teachers, as a “voice”, in the vast expanse of cyberspace. Because of this void, I decided to start a music, technology, and education blog, based on the WordPress platform, to help kick-start the conversation in the evolving digital informational medium (what I refer to as the Web 2.0 stream). During the first couple of years of my personal blog (which later became MusTech.Net), I wrote hundreds of posts and started hundreds of more dialogs among music teachers visiting my website. This new, blog-based, type of communication was very exciting and allowed for two-way communication (Web 2.0) to transpire among the readership. It was not long before I found a number of others that had started to write similar blogs (Dr. James Frankel, Dr. Miika Salavuo, and Evan Tobias -to name a few) and we began to connect with each other’s work using technologies such as RSS (Really Simple Syndication) and ATOM feeds. Through RSS, hyper-linking, and the sharing of our websites utilizing “blog rolls”, a virtual community of music educators began to form around this new concept of Web 2.0 communication and diaspora. In addition to these new websites and blogs, a number of music teachers, including myself, began to create shared Wikis (group collaborative websites) and offer podcasts focused on music education related topics. In a time period where most of the established music education societies and associations were still very stagnate and restrictive with their websites and information, the advent of these new Web 2.0-style websites created a fresh perspective for our profession and sparked a new zeal in those that were connecting to and utilizing these new types of online resources. Toward the close of 2007, I decided to move forward with a music education blogger initiative and announce, in January of 2008 at the Florida Music Educators Association Conference, the start an official campaign to get 100 music educators actively blogging by 2009. The campaign was successfully completed ahead of the deadline. In part because of this campaign, there were now large amounts of materials being created by the music education profession that were being pumped directly into the Internet ecosystem for others to find. Around that time, I started the Music Education Blog Carnival and the website, MusicEdNews.com, which are both still active and provide outlets for the works being generated by those blogging about music education. The Web 2.0 stream started to shift for me in 2009 when a number of us (music bloggers) started using Twitter as an additional conduit of information and another way to broadcast items of interest to music teachers at almost instantaneous speeds. It was not long before “our” adoption of Twitter was manifesting itself at regional, state, and national conferences where it was used to distribute clinic and exhibiter information via Twitter “hash tags”. Hash tags, as used within Twitter, allow thousands of people to congregate around specific topics and are similar to a type of keyword. On March 1st, 2010 Andy Zweibel (the originator of the #musedchat hash tag) and I co-moderated the first ever music education conversation on Twitter using the #musedchat hash tag –it was a huge success. This conversation has continued every Monday evening since the launch. At this point, it was becoming clear to me that the social conversation about music education had begun to evolve from the dialogs that were previously being had on the individual blogs and websites to now include conversational streams generated on the more popular (and more populated) social media platforms such as Twitter. One of the beautiful things about using Twitter is that the users have to be succinct with their statements (only 140 characters per update) –it is also one of the limiting factors of it. 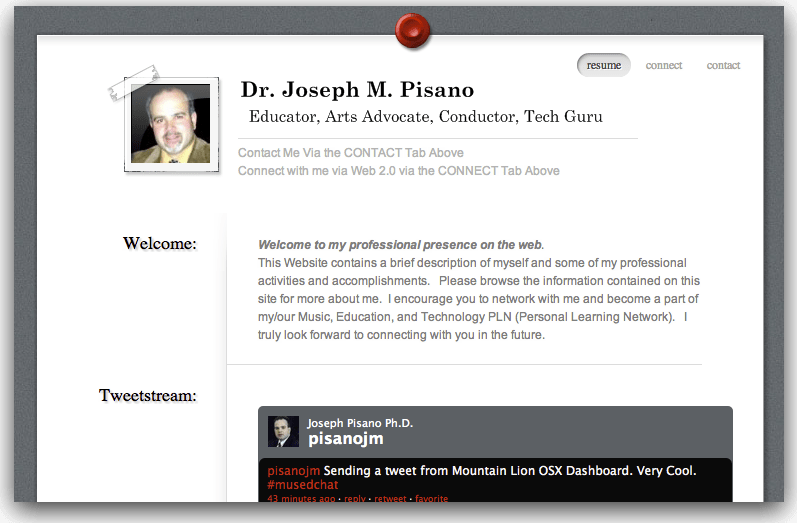 In May of 2010, I decided to launch one of the most advanced music education-related social media platforms ever to be designed: the MusicPLN.org. Short for the Music Educators Professional Learning Network (MPLN), it was created to address some of the shortfalls of Twitter and all of “our” existing social media initiatives. The mission of the MPLN was one that I’ve had in mind since I started this journey down the Web 2.0 stream: “…to generate better, more accessible, information about music, education, and technology and to freely encourage dialogs from Music Educators through social media outlets…”. Toward the end of 2011, I began to see a number of signs with regard to a new, stronger, current in the Web 2.0 stream, Facebook Groups. Facebook had always been a secondary conduit for communication by our virtual community, but we had never adopted it completely or successfully; however, once I began in earnest deliberating over its functionality as a viable use for our virtual community, I was convinced that it could be an even better platform for our discussions given their recent changes to their Facebook “Group” sections. This became evident to me with the radical success of the Band Directors’ Group on Facebook –founded by Brian Wis who was one of the original steering committee members of the MusicPLN.org. With the new insights about Facebook, I decided to evolve the MusicPLN.org into a Facebook Group called the Music Teachers Group. Along with a prominent group of music educators that include Amy Burns, Barbara Freedman, Richard McCready, and Thomas West, we official launched the group in April of 2012. At that time, I also made the bittersweet decision to close the MusicPLN.org after a very successful two years. The MPLN, at its peak, had over 2,500 members, 37 forums, 1,000 topics, and over 12,000 user updates. These types of statistics demonstrate the effectiveness and need for these types of profession oriented groups. I absolutely see the move to Facebook as a positive one even though the functionality offered though Facebook is less than that of the MPLN. Facebook currently has over 155,000,000 (155 million) members in the United States alone (http://www.socialbakers.com/facebook-statistics/) and the average user spends 7 hours and 45 minutes on Facebook each month -checking-in multiple times per day (http://blog.nielsen.com/nielsenwire/online_mobile/august-2011-top-us-web-brands). Given the near universal adoption of Facebook by the population, the decision to move the “virtual music conversation” to where the people are congregated made/makes a lot of sense. This change also eliminates the need for members to have to periodically visit and follow “yet another website” as they will likely already be a member of Facebook. The Music Teachers Group on Facebook (http://www.facebook.com/groups/musicpln/) is a private group that any music teacher can freely join to read or discuss topics that are of interest to them. Although, as previously stated, the functionality of the group is somewhat reduced from that of the MPLN, the original mission of the MPLN is easier to attain via Facebook with regard to creating and sustaining dialog among all music teachers wherever they might be. Facebook is also “mobile-ready” and easily integrated into our new, smart-device oriented lifestyle(s), making it easier to stay current with the conversations happening in the group. The transition to Facebook went very smoothly and, in less than two months, there have been hundreds of updates created by the groups’ 1,600+ members. I do not think the Music Teacher Facebook Group should replace the need for music education bloggers, our robust Twitter community, or any other social medium that music teachers may be using. We do not need to adopt one social media form of communication over another, but rather find ways to create effective opportunities for those already using them, whatever they might be. Many national music organizations such as NAfME and TI:ME are now very active with social media and it is exciting to see the resources and communities that they are fostering because of it. Wherever the online conversation may go with regard to music and music education, it is my hope that all musicians and educators will adopt and embrace these amazing social media technologies for professional development, to support their own programs, and to glean from all of the opportunities that they afford when used effectively.